A homogeneous dispersing granule that combines pure, dry humate and humic acid precursor, Humic DG provides all of the proven benefits of humic and fulvic acids in an easy-to-use product. The Anderson’s Company combines pure, dry humate with their patented dispersing granule (DG) process to create a spherical granule that contains thousands of micro sized humate particles.Within a few minutes after watering, these micro sized Humic DG particles dissolve into the soil, immediately going to work to improve nutrient efficiency and soil conditions. 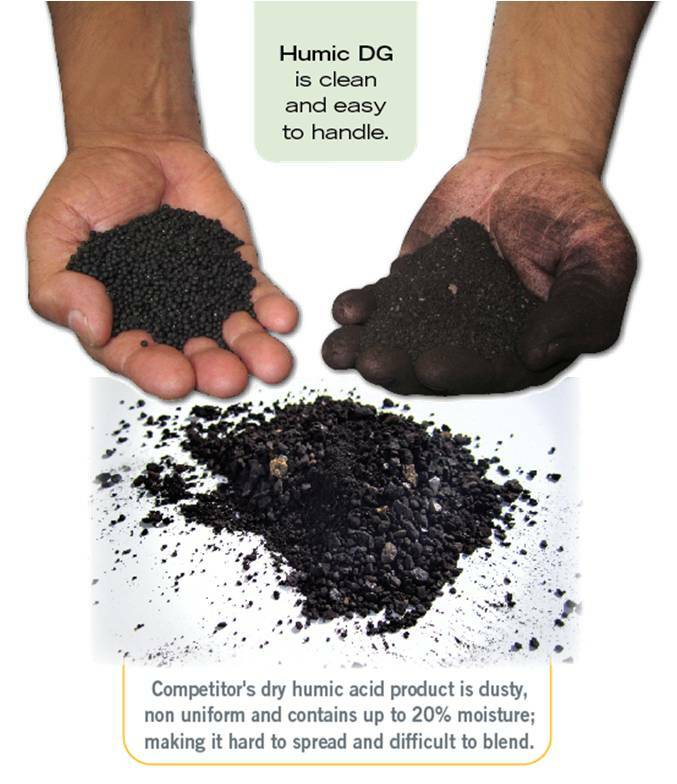 Humic DG is biological, dispersible, spreadable and blendable. Biological: Humic DG contains 4 biologically active components; humic acid precursor, fulvic acid, humic acid and humin. These components range from very soluble to completely insoluble in soil media, working together to provide the soil with a broad range of biological benefits, from plant available fulvic acids to the insoluble, high nutrient holding capacity of humin. The “magic” in Humic DG and Black Gypsum DG is the dispersing granule (DG) technology, which serves to enhance humate distribution. Upon contact with water, each DG granule disperses into thousands of micro particles, which move directly into the root zone and begin working to improve the health and quality of your turf, crop or plant. Spreadable: Humic DG’s uniform, spherical granules allow for ease of spreading through all standard application equipment. While competitive humic acid products are non-uniform and dusty, Humic DG’s granules are uniform, spherical and dust-free.